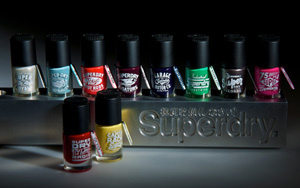 Superdry are set to launch its own collection of nail varnish in Spring 2011. The array of nail paints come in 10 different shades which have been chosen to mix and match with favourite and best-selling Superdry tees. Exclusive Superdry nail paint bottles are embossed with the Superdry hand-drawn graphics logos. Colours include: Pigment Yellow, Soft Green, Enamel, Jet Blue and vivid pinks in Rose, Punk as well as a classic, Rich Red. Superdry’s nail lacquer is long-lasting and easy to apply, with a smooth finish and will be available in all Superdry stores and online at http://www.superdry.com/ from March 2011 priced at £6.00. What are your thoughts? Are you keen on all of these clothing brand nail polishes ?